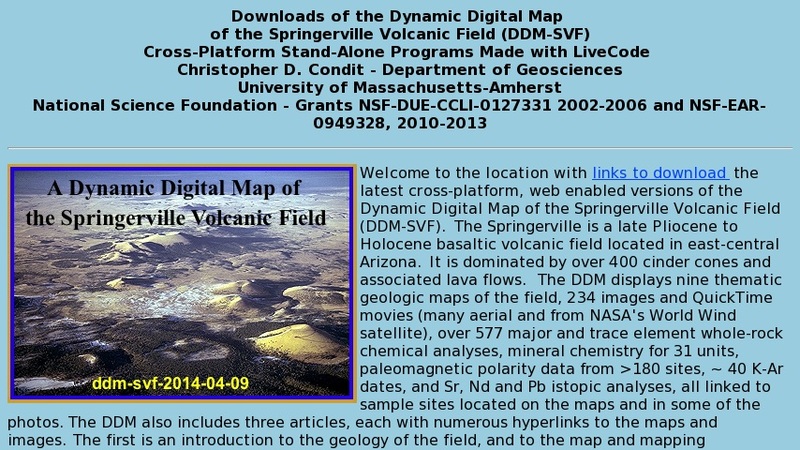 Dynamic Digital Map-Springerville Volcanic Field (DDM.SVF) is a stand-alone "presentation manager" program that contains and displays four thematic geologic maps of the Springerville volcanic field, Arizona, on the Macintosh computer. The download, 20 MB compressed, 37 MB expanded) is essentially a complete "geologic map on disk", with detailed high quality thematic maps accessed by a click on parts of the "home screen" which is an "Index Map" showing the detailed map coverage. It includes 75 photographs (many are oblique air photos), unit descriptions and analytical data displayed with a mouse-click on the symbol when a map segment is displayed, or by single or double click on the sample on a list to find it on the map, or to display its associated data. The program includes an automated "guided tour" which, within six minutes shows most of the major features of the DDMs and how use them. Useful for general earth science classes interested in looking a young volcanic field, freshman physical geology classes (the same use), and petrology classes interested in using the data for modeling purposes.